In March 2018, Lindi Ortega debuted a “triumphant” (The Guardian), three-part ‘Liberty’ album, which was a “deeply endearing” (VICE noisey) cinematic exploration of American culture. Now, Lindi Ortega introduces a purely instrumental ‘Liberty: Piano Songbook,’ out today, Fri., Jan. 25. Armed with vocals that have been compared to artists ranging from Dolly Parton and Lana Del Rey to Amy Winehouse and Janis Joplin, Lindi’s signature croon is obviously absent in the music — encouraging the listener to dive into the real, raw emotion of the album itself. With the help of ‘Liberty’ (3.30.18) producer Skyler Wilson, Ortega pulls 12 of the original album’s 15 tracks and reimagines them with the help of multi-instrumentalist Robbie Crowell (Kesha, Midland). While Ortega does play piano, having another musician record 'Liberty: Piano Songbook' allowed her the critical distance to enjoy her songs as a listener, free of the self-critical ear artists typically bring to their own work. Ortega spent last year sharing bills with Jason Isbell and Asleep at the Wheel, and she'll will kick off a North American tour on Fri. Feb. 5 at Centre in the Square in Kitchener, Ontario, Canada. For tickets and more info, visit lindiortega.com. Following a widely acclaimed Liberty, Lindi Ortega returns with an entirely instrumental version of the 12-track “cinematic journey" (NPR Weekend Edition) on January 25 titled Liberty: Piano Songbook. In March 2018, Ortega released Liberty, a record that draws on the epic work of Oscar-winning composer Ennio Morricone, who became one of Ortega’s musical obsessions during the writing and recording of Liberty. She enlisted Nashville producer Skylar Wilson (Joshua Hedley, Justin Townes Earle, Rayland Baxter) when she discovered their shared passion for Quentin Tarantino movies. Following the release, Ortega and Wilson developed the concept for the Liberty: Piano Songbook with multi-instrumentalist Robbie Crowell (Kesha, Midland, Deer Tick), who had previously played with Ortega, recording the solo arrangements at Creative Workshops in Nashville. The fresh versions of these songs transform them, moving away from the spaghetti-Western production while maintaining a cinematic tone that musically complements the lyrical themes of Liberty. Ortega staged a North American and European headlining tour in 2018, and also toured with Jason Isbell and Asleep at the Wheel. In August, she released Liberty: Parkhill Sessions, recorded at the Parkhill Studios in Calgary, Alberta. The EP featured stripped-down versions of three Liberty songs — “The Comeback Kid”, “Forever Blue”, and “Lovers in Love”, recast as a duet with Corb Lund. A concert event like no other, The Longest Road Show celebrates the amazing talents that arise from the endless miles of touring, and a journey of discovery for performers and audience alike. Spotlighting a killer lineup of road-tested musical artists — a bill co-headlined by Terra Lightfoot, Lindi Ortega, and Begonia — The Longest Road Show will wind its way through major markets across Ontario in February 2019. Tickets go on sale as of 10am Friday November 23. Full tour dates can be found below. Each night on The Longest Road Show will feature these stellar artists performing in a showcase format. Every concert features the backing of the Longest Road rhythm section (bassist Anna Ruddick and drummer Michelle Josef), plus special marquee and local guests. And each show will be a medley of intermingled performances, with an intermission mid-way. Arrive for door time, get comfortable, and prepare to discover new favourite musicians as you enjoy a collaborative concert experience unique to your town. 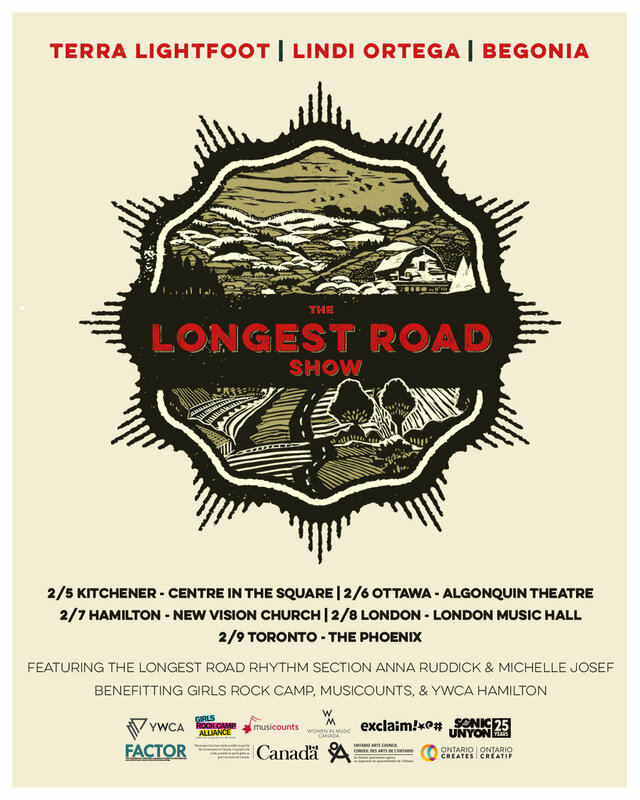 The Longest Road Show is produced in conjunction with Sonic Unyon and LiveNation Entertainment, sponsored by Exclaim!, and benefitting Women in Music Canada, MusiCounts, YWCA Canada, and Girls Rock Camp. Begonia’s Alexa Dirks has never been able to fit into the box of being a "conventional woman". “I’m loud, I’m awkward and I’ve always taken up space. I've done things my whole life that some people would tell me weren't appropriate 'for a girl'.” That narrative that once tore Dirks down is now what empowers her to take charge of her own story, in her own way. Winnipeg-based Dirks is a Juno Award winner with her former group Chic Gamine. While she thrived off of the collaboration, once the band broke up she knew she was ready to go solo. As Begonia, Dirks is bold, brazen with her florid, surprising pop that is tempered with sensitivity and wisdom. Her 2017 debut EP, Lady in Mind, was listed on NPR’s 10 Artists You Need to Know and the track “Juniper” reached #1 on the CBC Music Charts. Dirks’ intimate lyrics and audacious pop style sound allows for her audience to relate to the messiness of life with an honesty that is refreshing.